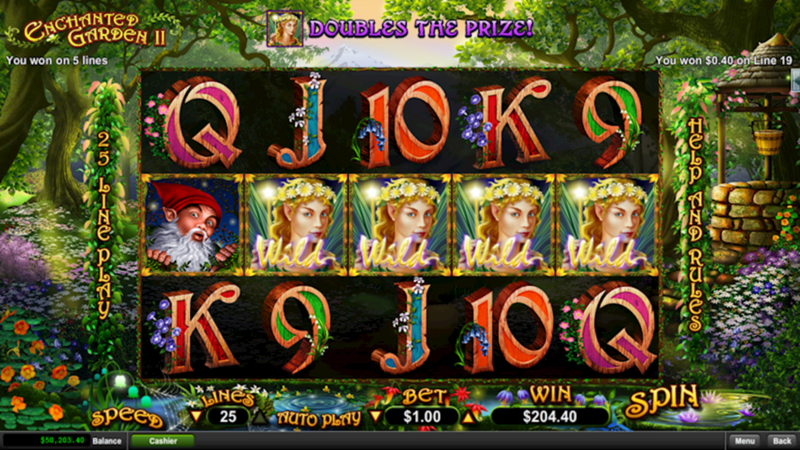 Enchanted Garden II is a top class slot game released by Real Time Gaming this month. It has a very simple structure which players of all ability can enjoy, this is due to the coin values ranging from 1c up to $5. The setting is a mystical enchanted garden that is reminiscent of the wonderful days where magic and fairy tales seemed like a plausible possibility. The game allows the mind to revert back to these wonderful times with hypnotizing graphics consisting of emeralds and other exciting mystical creatures just waiting to be discovered. The powerful Fairy Queen feature awards the Firefly feature with extra Fairy Princess wilds! The enchanted garden represents the scatter symbol which can appear on any reel. If you get 2 or more gardens on any spin you win. Placing between 2 -5 of these symbols across the reels allows you to multiply your bet by 1x, 5x, 15x, 200x, meaning the maximum bet of $100 can lead to an impressive win of $20,000. The fairy princess is the wild symbol which appears on reels 2,3,4,5 and will substitute for any other symbol besides the scatter. The top award available is 15,000 times bet per line, so although there is not a progressive jackpot players can still win substantial amounts. Enchanted Garden 2 is a colorful, vibrant slot game with lots of rewards and opportunities to win, fans of the first one will definitely enjoy the the follow up.